By Ann M. Graf, Amanda I. Seligman, & Margo Anderson. Are you researching the history of the Milwaukee area and looking for suggestions about what to read next? If so, this Bibliography of Metropolitan Milwaukee provides an excellent starting point. Organized into 19 thematic chapters that are further organized by topic, The Bibliography of Metropolitan Milwaukee includes resources for Milwaukee, Ozaukee, Washington, and Waukesha counties. Subjects covered include places, biographies, race and ethnicity, politics, business, the economy, charity, religion, the arts, architecture, recreation, health, gender, the natural environment, media, infrastructure, bibliographies, and archives. This volume offers the most comprehensive bibliographical resources about the Milwaukee area ever produced. Ann M. Graf is a PhD student in the School of Information Studies at the University of Wisconsin-Milwaukee. Her research involves classification, knowledge organization and community archives. Amanda I. Seligman is Associate Professor of History and Urban Studies at the University of Wisconsin-Milwaukee and co-editor of the Encyclopedia of Milwaukee. Margo Anderson is Distinguished Professor of History and Urban Studies at the University of Wisconsin-Milwaukee and co-editor of the Encyclopedia of Milwaukee. 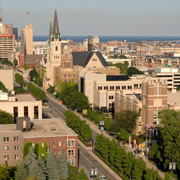 Founded in 1916, the Marquette University Press, located in Milwaukee, Wisconsin, publishes scholarly works in philosophy, theology, history, and other selected humanities. Read more.